There is no reason that bodybuilders cannot continue to get stronger, leaner, and gain muscle during Ramadan using these nutritional and workout tips. In many ways, its actually the perfect opportunity to get leaner and stronger. To backtrack a bit, for those who don’t know what Ramadan is, its a time for spiritual reflection and it is the most sacred month for Muslims. Between Fajr, the first prayer time of the day which is a few hours before sunrise, and Maghrib, the fourth prayer time of the day (around sunset), they do not eat nor drink anything and there other restrictions as well. The more northerly your longitude, the longer the fast period – it can be as long as 20+ hours. As you can imagine, it does make gaining muscle and losing fat a bit of a challenge. 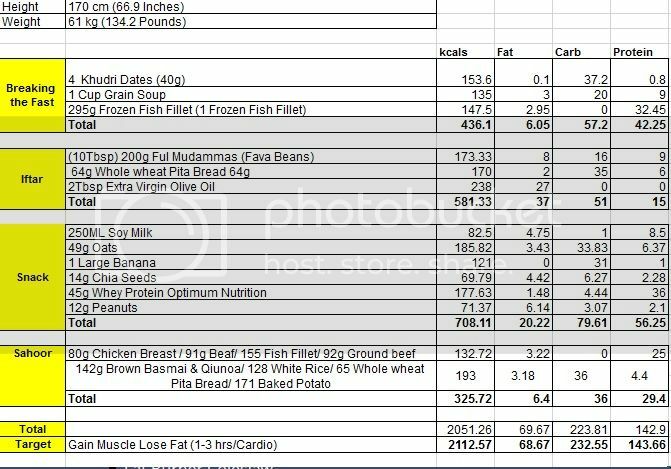 So during Ramadan, how can you keep making progress in terms of strength gain, mass gain, and bodyfat reduction? A few general pointers. First, not being able to drink water from Fajr and Maghrib (12 – 20 hrs) isn’t a problem for most people observing Ramadan but it can be a major problem for those involved in fitness. Dehydration can decrease your strength by up to 19% and if its hot, the dehydration can be life threatening as well. So my first point is that you probably need to eliminate all cardio during the month of Ramadan unless you live in Greenland, Iceland, or the North Pole. If you live where its hot, substitute walking for your strenuous, sweaty cardio sessions. The other thing you can do is use interval training. If you normally do long runs, long bike rides, then Ramadan is a perfect time to switch to interval training. With 10 minutes of intense interval training you get a maximum amount of cardiovascular benefit and metabolic rate boost with a minimum amount of lost sweat. For example, 5 minutes light jog followed by 10 reps of 30 seconds max sprint and 30 seconds walking. After Maghrib and before Fajr you need to make sure you get *lots* of water, even if it interferes with your sleep because you have to get up and pee all the time. Remember that thirst is a very bad indication of dehydration. By the time you are thirsty, its way too late. It can take many hours for your body to become fully hydrated and until that point, you do not have 100% of your strength. Especially important is in the morning. Right when you wake up, drink a liter or two of water before Suhoor. Not only will this quell your appetite so you can be satisfied with fewer calories but it starts hydrating your body after your sleep. How much and what to eat. In my opinion, as a bodybuilder, it is far more important WHAT you eat then WHEN you eat it. Because you are reducing your cardio, you are going to have to lower your calorie intake as well to keep from gaining bodyfat. Remember, use Ramadan as an opportunity to become leaner! Use my calorie calculator to see how much you need to cut back based upon your lower levels of exercise by using my calorie calculator. When you are starved and feel like wolfing down the entire refrigerator, water is the tool you need. Before eating anything, drink at least a liter of water, wait 20 minutes, then eat. An ideal first meal after Maghrib is a small handful of dates. Your body needs good, clean nutrition during Ramadan even more than it does during the rest of the year. Don’t stress your system out by eating a bunch of sweets and junk. If you are only going to eat healthy once a year, this is the best time to do it. You have no room for nutritional garbage during Ramadan. I know there are many traditional foods you will be eating, take just small portions of things that are calorie dense and have slightly larger portions of things with good complex carbohydrates in them, lean protein in them, or vegetables in them. Its all about portion control. If you never use any supplements, Ramadan is one time you might consider a good organic protein powder. Given the small eating window, getting enough protein to build muscle is a major challenge. 45g of protein mixed with water right before going to be and right before Fajr can go a long way to giving you the protein boost you need. First, relax. Many people feel their bodies are going to shrivel up and blow away if they don’t adhere to their 2 hours of lifting a day workout plan that they have been doing for the last 10 years. I can tell you first hand that on many occasions while doing month long bike treks that are physically very demanding that I have been able to decrease bodyfat while making strength gains with a minimum of working out. Ramadan is a great time to switch to a totally different workout plan and confuse those muscles. There isn’t a lot of free time during the day during Ramadan so when you workout, every minute has to count. Five day splits are out, even if you are advanced bodybuilder. I would suggest either full body workouts three days a week or a three day split like my intermediate workout. If you squat, deadlift and bench then just stick to those three exercises and make a simple 45 minute full body workout you can do three times a week. If you don’t do those exercises, then do my beginning workout. If you really want to mix things up then do more of a martial arts style workout plan where you do bodyweight exercises every single day. The key here is not to fret about not being able to do the workout you do the other 11 months of the year, use this month to totally confuse your muscles and throw something at them they are unaccustomed to. Muscle confusion – growth! Please read “Sleep and bodybuilding“. Getting enough sleep is critical for gaining muscle mass and getting stronger but it is even more critical if you are cutting to try and lose bodyfat. The problem is that when you are sleep deprived and running a caloric deficit you end up losing more muscle and less fat which is NOT what you want. No, you don’t need to get all 8 hours of sleep at the same time – its simply not possible with the five prayer times. You need to nap when you can and attempt to get a total of 7 or 8 hours sleep during the 24 hour day. Making time for napping is critical, make it a priority. So when to workout. Optimally, I would suggest working out right after Fajr when you are rested, fully hydrated, and have food in your system. If thats not possible, next best in my opinion would be to wait until after Maghrib, have a small handful of dates with lots of water (a few liters), workout, and then have your full meal. My opinion is that option 1 below is superior because it allows you to be fully hydrated and nourished before working out but option 2 is good too. Metabolic changes during Ramadan fasting for those of you with scientific curiosity. Physical performance and training response during Ramadan observance, with particular reference to protein metabolism. Achieving optimum sports performance during Ramadan: some practical recommendations.